– We hired a car in Istlanbul so that we had lots of freedom. Its expensive, there are long distances to drive, and the Turkish road rules are that there are no rules – but I don’t regret doing it as it meant we could go off the beaten track. However, I’ve also heard great things about the local dolmuses (buses). 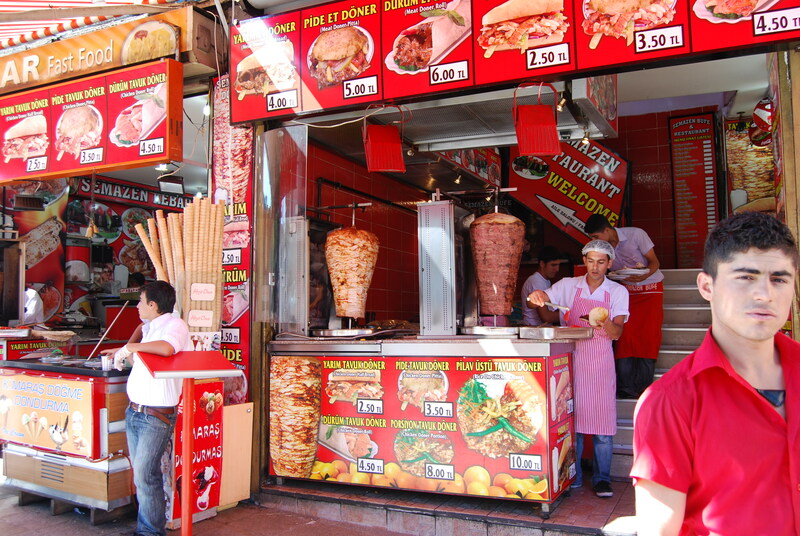 – Eat kebabs, lots of them, from the street kebab shops. Better than the poshest restaurant we ate at – its lamb and chicken shish all the way. Also try the yummy pancakes (gozleme), shepherd’s salad and mezze. – In Istanbul, eat mezze in a cafe on Nevizade Sokak (street) which is lined with restaurants, have cocktails at sunset on the rooftop bar at the Mamara Pera hotel. 360 and Babylon bars were also recommended by my friend Pablo who lived in Istanbul, but we didn’t make it there. 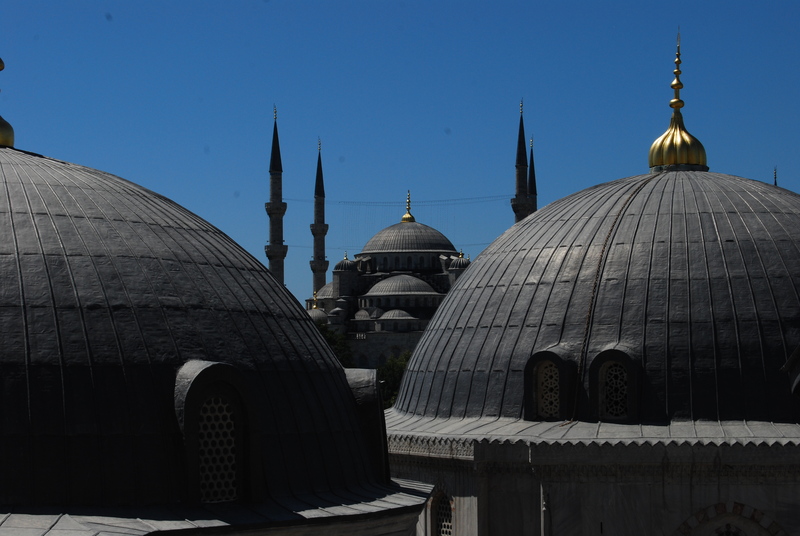 Go to the mosques and eat kofte or kebabs at the nearby restaurants. 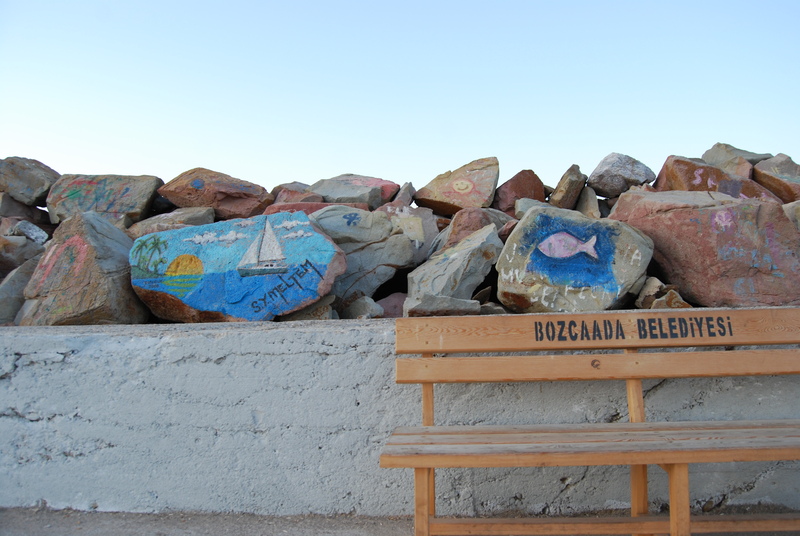 – Go to Bozcaada island (pronounced Bosjaada) – its touristy but mostly Turkish tourists, the Kale Pension has great breakfasts, there’s good beaches, great seafood in harbour-side restaurants and in alleyway eateries, great bars, and a chilled out vibe. – Drive through the beautiful Gallipoli Peninsula and visit the Helles Memorial. 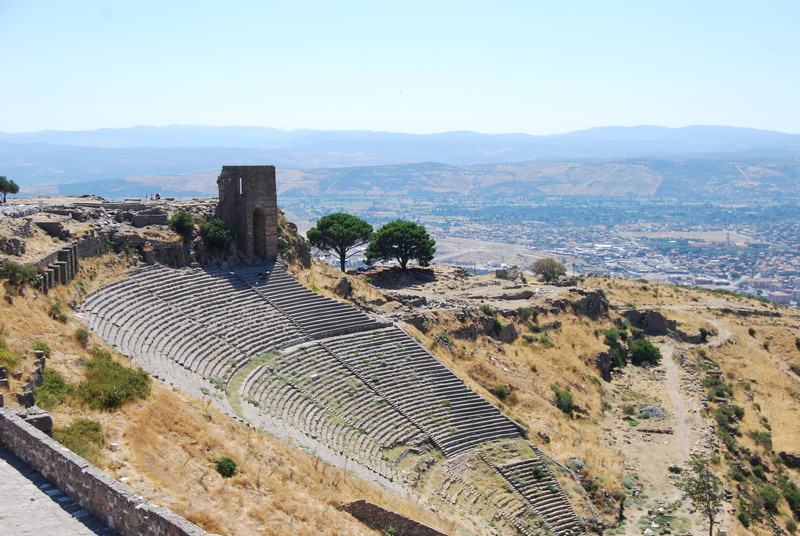 – See the ruins at Epheseus or Bergama (for Pergamon) . We went to the latter – the Acropolis is gorgeous, with hardly any tourists (unlike Efes) and a huge amphitheatre built into the cliff (see below), and we also saw the Asclepion medical centre. We stayed at the Akropolis Guest House – pretty good value and nice owners, although its far from the “boutique hotel” described in the Lonely Planet. – We then went to the Dilek National Park (see photo below) – great for walks and beaches. We stayed at the wonderful Ecer Pension where we were treated to delicious homecooked meals which we ate on the roof terrace with the other guests – highly recommended. – Then on to the most relaxing experience of the holiday. We drove down the coast to the peaceful Kabak, via a winding mountain road up from Olu Deniz, to Shambalah. It’s run by Turkish volunteers who live and eat there for free, in return for serving the guests. The communal food is fantastic, served in the relaxed outside seating area, the huts are all wooden and have incredible views of the sea, and there are daily yoga classes. They even have their own shaman! Its not too hippie though, its professionally run, there’s a bar for late night parties, an amazing pool (see photo below) and trance was only played once while we were there… Only problem is there is absolutely nothing to do there – apart from lounging on hammocks, swimming in the pool and reading – so unless you are energetic enough to go on a boat trip or a hike, you’re likely to spend most of your time just…doing nothing. Which is bloody brilliant really. – We then went to Antalya, which I wish I could say good things about, but I just can’t. Avoid avoid avoid. Apart from the brilliant Owl bookshop, with a lovely eccentric owner who fed us melon and recommended us books, but even he said the town had got “ugly“. We ate at a restaurant which was home to a stray cat with its ear bitten off by a dog and did a boat trip where we stopped to swim over an oil slick – that typifies our trip to Antalya, sorry. 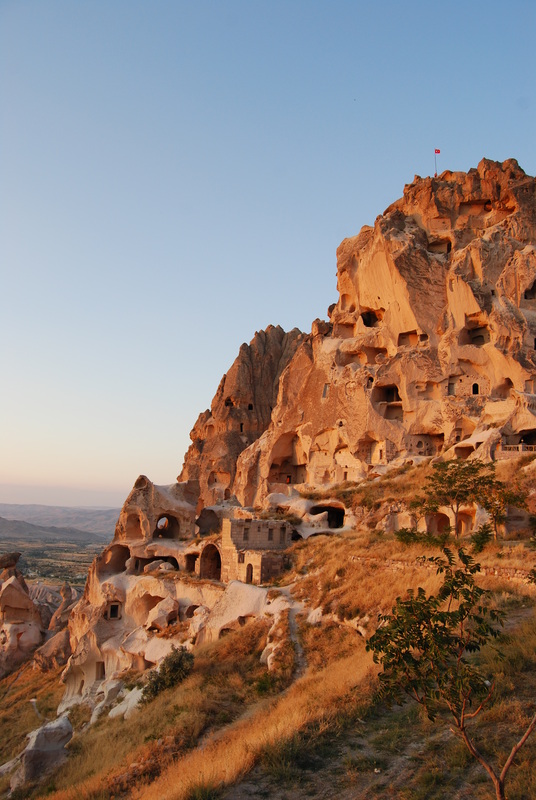 – We then drove on to the amazing Cappadocia. 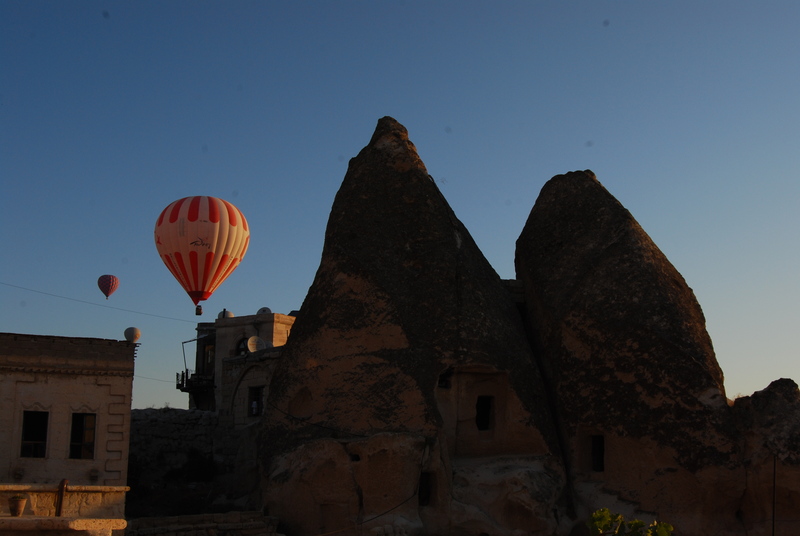 We decided to stay in Goreme as it is the biggest, most scenic place and a central base. You can walk to all the bars and restaurants – Cappadocia Kebab Centre has the best kebabs we had and A’laturca was our most swanky meal. I’d recommend the popular Kelebek Hotel (see photo below) although filled with tour parties and, sorry, Americanos, it had the best view in town, a great pool, good value rooms (35 euros for an authentic cave room) and good breakfasts. If you want a more sociable meeting place, then some of the hostels in town also have pools and look like great choices. You can do some great day trips from Goreme including the fairy chimneys at the Goreme Open Air Museum, walks through Goreme’s valleys (guess why the Love Valley is so named – see below), discovering the underground cities, drinks or dinner in Urgup, and walks amongst the byzantine rock churches and caves at Soganli and Mustafapasha . 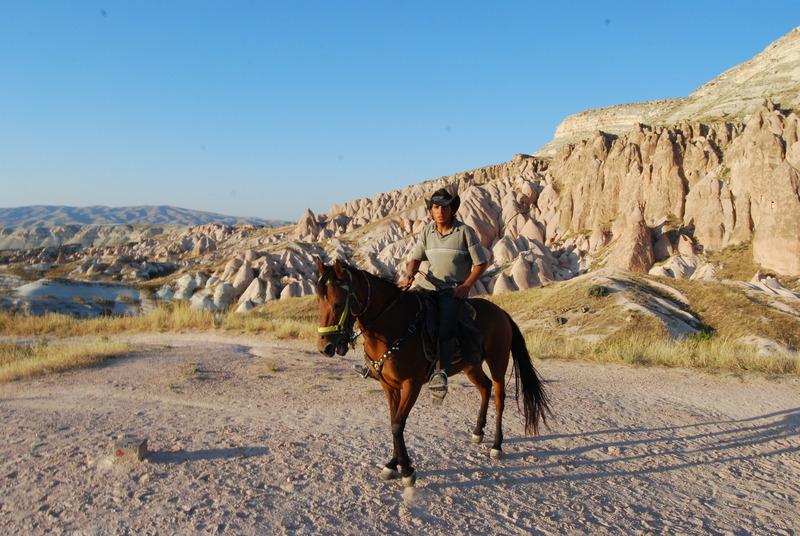 Make sure you go horse riding with the Dalton Brothers who’ll take you on Anatolian horses throughout the various valleys (it on the left on the road to the Goreme Open Air Museum, no sign sadly, or book for a few extra euros through the Kelebek Hotel). Uchaisar, which attracts French speaking vistors, is smaller but has the most incredibly castle (see photo below). 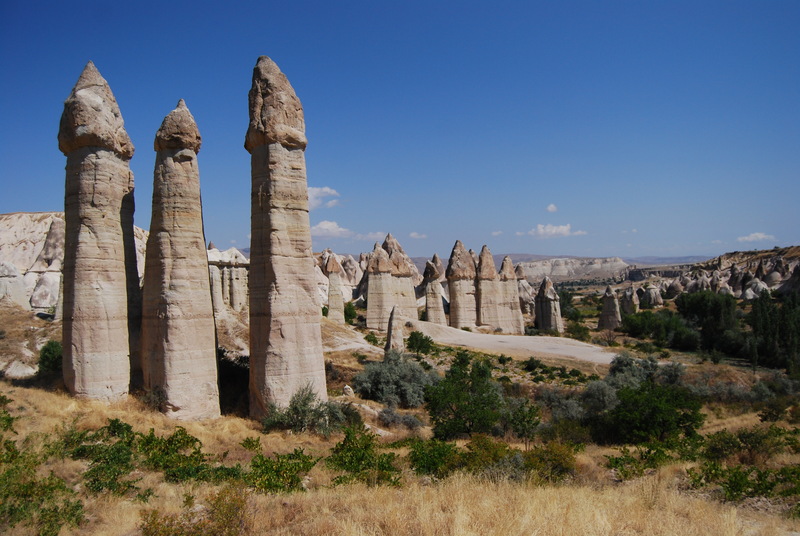 Worth a day trip but I preferred Goreme as a base.